Maintaining a healthy neck (cervical spine) has massive implications for your overall health. The cervical spine is an amazing feat of evolutionary engineering. Structurally, it is nothing more that seven vertebrae sitting vertically on top of each other. Yet functionally, it is a protective column for so many vital components of your nervous system with a complex integration of muscles, tendons, ligaments and blood vessels. It does this, while simultaneously being the most mobile area of our entire spine (White and Panjabi 1990). So maintaining a healthy neck is incredibly important. In this blog post, I will mainly discuss with you the aspects of its shape and function, but include how Chiropractic care can help you maintain the health of this important area of your spine. The normal shape of a healthy neck, or cervical spine, is of a C-shaped structure (Grosso et al 2012) called a lordosis. It has a linear, geometric shape that approximates a piece of a circle (Harrison et al 1997). It is commonly said, taught and described in anatomy textbooks that the C-shaped curve of the cervical spine develops as a secondary curve during infancy and early childhood (Bagnall et al 1976). However, there has been published data from as far back as 1976 when Bagnall and colleagues published a radiographic study into human foetal development. They found that 83% of their subjects displayed a normal curve, called a lordosis. They also found this shape was present in subjects as early as 9.5 weeks conceptual age. Yet it would appear that this 40 year old published data has been over-looked or forgotten. It has been found that changes in the shape or structure of the cervical spine has enormous implications on the health of the spine itself. Harrison et al found in their study that changes in the normal lordosis compared to three different types of reversed, or kyphotic shapes can increase the compressive loads on the spine by up to 18 times normal values. This increase in load triggers the production of inflammatory chemicals and destructive enzymes within the discs, that trigger the cascade of degenerative disc and joint disease (Truumees 2012 and Ferrara 2012). So we know that the cervical spine has a normal shape, called a lordosis, that develops prior to our birth. Why would it change shape? What kinds of things can lead to changes in its shape? What effects does this have on the health and function? And what impact does this have on your overall health? So how can you maintain a healthy neck? Well a great place to start and important to remember that the shape of your neck is formed during your foetal development, so these changes can occur gradually, over time from childhood. So getting your children’s spines checked is probably the best pace to start! Get them checked if they have suffered trips and falls. This, I know, sounds like a ridiculous thing to say because all kids have trips and falls, but it is something that is not to be over-looked by us adults, these things can be caused and begin during childhood. If left unchecked, they can create problems later on in life, as described above. Another great place to start is maintaining a healthy posture as much as possible. This includes when using your mobile phone and tablet devices, when sitting at a laptop and using a computer and when reading a newspaper or a book. Try to hold these devices higher up, away from you chest/waist. Try to have them at eye level. Elevate your computer screens to your eye level also. For more info on workstation ergonomics and to assess your own workstation, click here for a pdf document published by the Health and Safety Executive. Get your spine and posture checked! 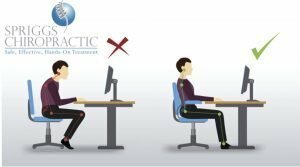 Your posture is the window to your spine, so having a full and adequate posture check can provide information into what may be happening underneath. 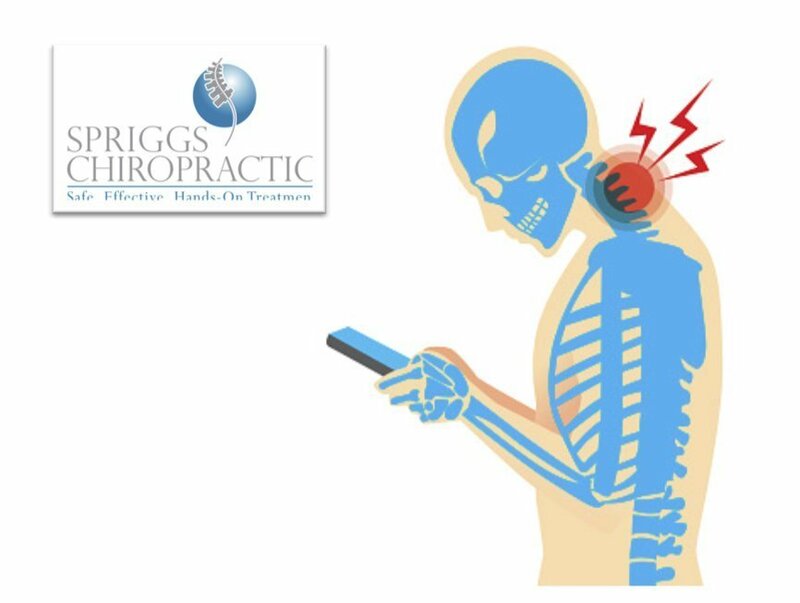 Here at Spriggs Chiropractic we offer free posture screening appointments and can provide you with more information on what can be done to help. If you have suffered previous trauma to your head/neck, if you suffer with chronic headaches/migraines, or if you simply want to find out more about the health of your spine, it may be worth making an appointment for an examination to assess your spinal health fully. We offer x-ray analysis to accurately measure and diagnose spinal conditions. Maintaining a healthy neck is of huge importance in modern society, get yours checked. For more details on maintaining a healthy neck, click here to watch a video by Dr Deed Harrison, President of CBP Non-Profit a spinal research group. Dr Deed is a world leader in spine research and is a Chiropractor with many years clinic experience. NB he gets very excited about this topic as you will see in this video. He is a great friend and colleague of mine. White AA and Panjabi MM 1990. Clinical Biomechanics of the Spine. J B Lippincott Company Ltd, East Washington square, Philadelphia, Pennsylvania 19105 P120-121. Foreman SM 1995. Long-term prognosis. In: Foreman SM, Croft AC, editors. Whiplash Injuries: the Cervical Acceleration/ Deceleration Syndrome. 2nd ed. Baltimore (Md) Lippincott Williams & Wilkins; p. 443-9.